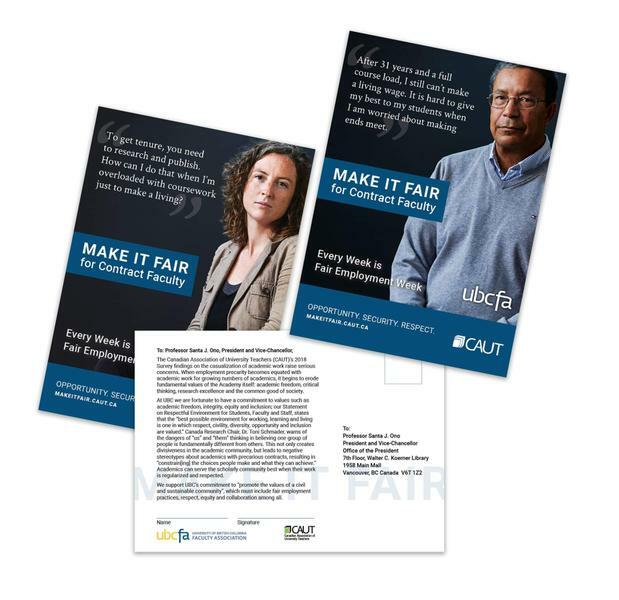 The UBC Faculty Association (UBCFA) recently held an awareness campaign in support of Fair Employment Week, a national event that highlights the economic and academic pressures on academic contract faculty across Canada. Hosted in the Nest on October 23, the association invited passersby to sign a petition and write postcards to UBC President Santa Ono about challenges the university’s hundreds of contract or “sessional” faculty members face. Some include a lack of job security, low wages and health barriers. UBCFA Contract Faculty Committee Chair Sarika Bose said sessional faculty are treated as a “second tier of professors,” whose precarious employment status and low wages impacts every area of their lives. “You’ve got a huge workload where people are working 60, 80 hours a week as opposed to 40, but are being paid as if they are working 30,” she said. A national survey of 2,606 contract staff by the Canadian Association of University Teachers (CAUT), which organizes Fair Employment Week, found that 48 per cent of contract staff were employed in at least one other job. Forty-five per cent said they would be unable to pay their bills without their monthly contract pay. Bose said students are also impacted by the precarity of these lecturers because their stressors and large workloads mean they often have less time to work individually with students. “What we’re asking for is a rethinking of how the different parts of the university are using [their] money," said Bose. Many sessional faculty say they also experience negative impacts on their mental and physical health. Two-thirds of the CAUT survey’s respondents felt a negative impact on their mental health as a result of their employment status. Bose added she knew of several faculty members whose minor ailments became serious after they neglected trips to the doctor due to their work commitments. “They don’t have time [to go to the doctor] because people are expecting their midterms back,” Bose said. Many sessional lecturers feel a need to conceal or avoid discussing physical and personal commitments for fear of losing course assignments. She says some sessional faculty are uncomfortable disclosing details about disabilities that might interfere with them doing their jobs. “I’ve known colleagues who have had serious disabilities that are invisible to other people and they’re terrified of telling the department,” said Bose. While the Fair Employment Week campaign has prompted a “supportive” response from the Provost’s office in the past, Bose said there is more to be done. "It would be good to see all of the different talent we have and all of the contributions we make to the university recognized in concrete ways,” she said. In a statement to The Ubyssey, UBC Vice-Provost and Associate VP Academic Affairs Eric Eich says the university values sessional lecturers and is aware of the challenges affecting them. “We also recognize those Sessional Lecturers who participated in previous Workplace Experience Surveys reported less favourably than their colleagues, and there is work ongoing to ensure we can address those areas of concern identified,” he wrote. Eich said the university is making an effort to increase the number of salaried lecturers at UBC, noting the number of contract faculty at UBC declined from 585 to 449 between 2009 and 2018. “[As educators] we feel that one of our jobs is to enable hope in the future. Hope in this generation,” she said.